Whenever anyone thinks of San Francisco, the Golden Gate Bridge is the first thing to come to mind. Although not actually golden in color, this iconic bridge connects San Francisco with Marin County, drawing tourists from near and far who gaze at this picturesque and magnificent suspension bridge. There are a few ways to view this magnificent bridge. If it’s your first visit, you’ll probably want to actually visit the bridge and maybe even get onto the bridge. If you do this, I suggest taking public transit – because who really wants to try to navigate San Francisco traffic and all those hills anyways? Not to mention that parking is pretty limited at most tourist attractions in San Francisco and it’s expensive. Transit directions to get the bridge can be found on the Golden Gate Bridge website. 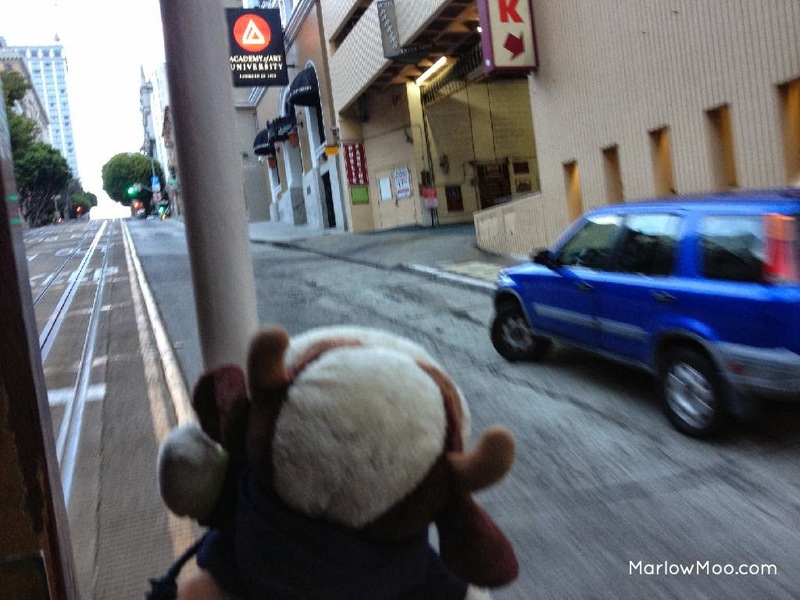 I'll discuss some hints and tips for taking public transit in San Francisco in a separate post. There are many groups that offer tours that drive over the bridge, bike over the bridge or walk over the bridge, but unless you’re looking for detailed information on the construction of the bridge, you can simply walk over the bridge yourself. If you’d like to bike over the bridge, there’s no shortage of bike rental operations in San Francisco, located in most tourist areas. There are vistas located on both ends of the Golden Gate Bridge, allowing you to have a breathtaking view of the bridge close up, and on the San Francisco side, there’s even a visitor centre and tourist shop. To get a different view of Golden Gate Bridge, on the San Francisco side, head underneath the bridge and visit Fort Point National Historic Site. For anyone who is a fan of Alfred Hitchcock, Fort Point is also where Madeleine from the movie, Vertigo, leaps into the Bay and Scottie has to leap in after to save her. You’ll still get a breathtaking view of the bridge and if you’re there early in the morning, a close up of the massive fog that seemingly engulfs the bridge every morning and every night. If you’re looking for gorgeous photos of the sun setting over Golden Gate Bridge, my favorite view is from the San Francisco Maritime National Historical Park in Fisherman's Wharf. Especially if you’re staying in Fisherman’s Wharf or downtown, it’s a lot quicker to get to San Francisco Maritime National Historic Park than to Golden Gate Bridge – 20-30 minutes via public transit versus 1 hour via public transit. I normally grab a warm drink from the Starbucks on the corner of Hyde Street and Beach Street, then walk down to the park and take a seat on the stairs just above the sand and wait. It does get pretty chilly in San Francisco near the water at night, so it’s a good idea to bring a backpack with some extra clothes so you can layer when it gets colder as the sunsets, plus some gloves. I also enjoy looking at the bridge from the San Francisco Maritime National Historic Park early in the morning as the sun is rising, however it can be a bit hit and miss as Golden Gate Bridge is often shrouded in fog early in the morning. So it's best to check out the Golden Gate Bridge in all it's glory from anywhere you decide to go either late morning or early afternoon once the morning sun shines through and the morning fog has cleared away. Lombard Street, known as the most crooked street in the world, originally it was like any other street. However, with such a steep slope, it was suggested that the zig zag pattern be added in order to reduce the grade of the hill which is at a 27 degree angle, which made it dangerous for vehicles to get down without reducing the slope. What was a practical solution to get vehicles and pedestrians down the hill safely has become a major attraction for tourists. One of the easiest ways to get to Lombard Street without climbing any hills is to take the Powell-Hyde Cable Car as it stops right at the top of Lombard Street. However, if you’re aiming to head out to Lombard Street pretty much anytime after 8am, the line up for the cable cars from Union Square or Fisherman’s Wharf will be ridiculous. Your other option is to take a bus that travels to Van Ness Avenue and get off a few blocks away from Lombard Street. Alternatively, you can walk to Lombard Street from Fisherman’s Wharf. Regardless of what route you choose to take, you will have to do some hills to get to Lombard Street. For the best pictures of Lombard Street, they’re best taken from the bottom of the hill and from across the street. Most of my pictures were taken standing in the middle of the road directly across from Lombard Street, so least to say I occasionally had to get out of the way of oncoming traffic that wanted to continue down the hill on Lombard Street, but most people tended to turn left or right when they got to the bottom of this twisted street. Some people who want to experience the winding streets for themselves will hire a taxi to take them down, drive themselves in a rental car or I’ve seen many people in GoCars driving down the hill. Do note however that you’re only allowed to go 8 KM/H down it and there’s always a line up of cars at the top trying to get down it. So if you’re not a patient person, skip the drive and just take a walk down the sides, enjoy the view from the bottom and move on. If you're looking to go when it's not too busy but will still be able to take great photos, go earlier in the morning before 8am. Not only will there be less traffic trying to drive the hill and fewer people climbing up and down it, but the line up for the Powell-Hyde Cable Car will be much shorter, allowing you to take it there and skip climbing up the steep streets to see it. If you’ve just finished checking out Lombard Street, then it would be the ideal time to check out Coit Tower which is nearby, just on the other side of Columbus Avenue. Besides, now that you’ve hiked up the hill to see Lombard Street, you should be all warmed up to walk up the Filbert Street steps right? Located on top of Telegraph Hill, Coit Tower was designed and built in honor of Lillie Hitchcock Coit, a wealthy socialite that was an avid gambler, often wore trousers long before it was acceptable for women to do so, and smoked cigars. Lillie also had a fascination with firefighters and rode along on the Knockerbocker Engine Co. 5 as their unofficial mascot through most of her teenage and adult life, working along side the men as a volunteer firefighter. Upon her death, she bequeathed 1/3 of her estate to the City of San Francisco to help beautify the city, and Coit Tower was erected in 1933. From the top of Telegraph Hill, you can get spectacular views of San Francisco below. 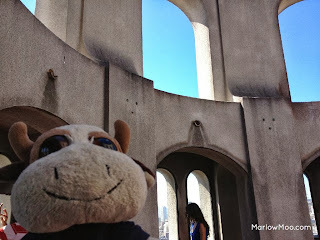 In order to reach it Coit Tower, you have two options to get there. The first is to walk up Filbert Street, which is so steep in places that steps have been built into the sidewalk to help pedestrians get up and down to Telegraph hill. Filbert Street is one of the two steepest streets in San Francisco at a 31.5-degree slope. The second way is a bit easier on the body but not on the wallet, which is to take a taxi up, which is what I did. I recommend if you’re coming from Lombard Street to walk to Columbus Avenue, and then call a taxi from the bottom of Filbert Street. It’s a short ride and shouldn’t cost very much, but will save you a ton of time and the exhaustion of trekking up the steps. To get up to the very top of Coit Tower, you’ll need to buy yourself a ticket to ride the elevator that takes you to the top. 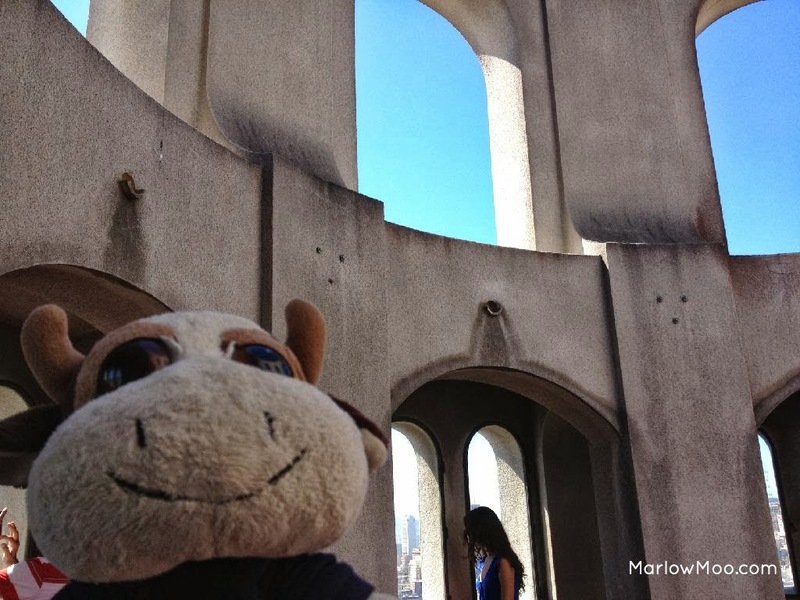 Note that tickets cost $7, which can be bought from the souvenir store inside Coit Tower, and they take cash only. Once you get your ticket, make your way to the line up for the elevator that will take you to the top. Once the elevator reaches the top, you will have to climb a narrow flight of stairs to reach the viewing area, but it is well worth the effort considering the gorgeous views of San Francisco you will get! Since the elevator to the top is frequent, it doesn't really matter what time you go as the line up to get to the top moves fairly swiftly. I will discuss more San Francisco Classic Attractions in my next post, but hopefully this post will help you to get started in planning your vacation to San Francisco! In the meantime, you can enjoy some of my photos of these classic San Francisco attractions at PhotoBucket!